It’s just like Doctor Who said: bow ties are cool. At least they are if you go for this classic choice from Moss 1851. Vivid red sets a stylish tone for the night ahead - and adds a dash of colour to your suit that helps you stand out from the crowd. And don’t worry: it’s pre-tied so you can skip those bow tie tutorials on YouTube and concentrate on looking sharp instead. Great items and materials used as always! Fits and does the job . Good quality. Everything I have bought, suit, shirt, tie and bow tie excellent value and all fit sound. Great quality tie, with a nice fit!! Lovely and neat bow tie. Looks sharp. Attractive bow tie. Havent washed it yet so don't know what will happen once its done. But so far...its good. It looks rich. Lovely item and looks great on. 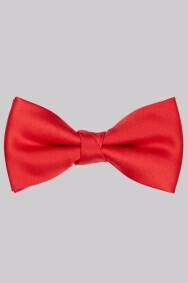 Very pleased with my red bow tie, excellent colour just what I wanted. Nice and shiny as it should be. Love the bow tie and my dad will too. It's classy and silky material. Very smart. Quality of suit and speed of delivery were excellent. Add to that value for money and you have a very happy customer who will be using Moss Bros a lot more in the future. The product itself is great quality. Would have been useful to have instructions or markers on the back to use the bow tie. Only had the tie because it came as part of the package - might come in useful. Its great value for money, just needed a one night suit and it was perfect. It was admired when I wore it, and easy to wear.